All six episodes from the ninth series of the revived BBC sitcom written by and starring Greg Hemphill and Ford Kiernan. 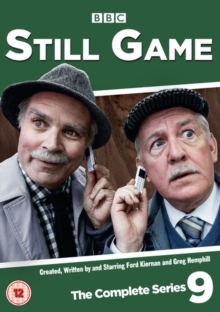 The show follows the lives of grumpy Glaswegian pensioners Jack (Kiernan) and Victor (Hemphill) in the fictional town of Craiglang. In this series, Jack and Victor finally catch up with the times and decide to buy mobile phones, Winston (Paul Riley) becomes an Internet celebrity and Isa (Jane McCarry) gets a new job cleaning at the undertaker's. The episodes are: 'Local Hero', 'Cat's Whiskers', 'Dead Leg: Part 1', 'Dead Leg: Part 2', 'Hitched' and 'Over the Hill'.